After winning their first two matches, Germany came into their third needing a single point to ensure they would finish as the winners of Group B. Instead Ze Germans won the match and finished with a perfect nine points in the group stage for the first time in European Championship history. 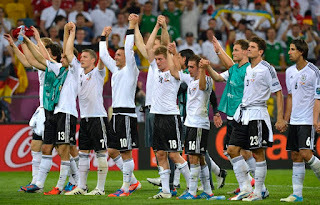 It was another impressive performance by Germany, meeting the expectations of many that had chosen the 2008 runners up as favorites. Manager Joachim Low made a single change to his starting lineup, choosing Lars Bender in place of the suspended Jerome Boateng. Low's single adjustment paid immediate dividends, with Bender scoring the winning goal that saw Germany safely through and eliminated Denmark. Scoring began in the 19th minute when Thomas Muller accepted a throw in and passed the ball to the center. Mario Gomez flicked the pass onto the path of Lukas Podolski and he celebrated his 100th appearance for Germany with the game's opening goal. It took only five minutes for the Danes to respond. Their answer came off of a corner kick that was headed by Nicklas Bendtner back across the box to Michael Krohn-Dehli. The winger flicked the header into the back of the net to earn his second goal of the tournament. Krohn-Dehli has been one of the biggest surprises of Euro 2012 and contributed two goals and an assist to the Danish efforts. Krohn-Dehli's heroic efforts were only outdone by his captain Daniel Agger whose impressive defensive displays were the source of frustration to all of Denmark's opponents. Agger's timely interventions prevented numerous German scoring opportunities, and were enough to earn him man of the match honors despite Denmark suffering defeat. When Portugal pulled ahead 2-1 in their match with the Netherlands, the commentators pointed out that if Germany were to lose, they would be eliminated. Almost immediately Germany responded with the attack that earned them the winning goal. Andre Schurlle led the attack and his long pass eventually found the path of the streaking Lars Bender, who calmly finished past Stephan Andersen. The goal sealed the game for Germany who had cruised through the group stages with relative ease. Denmark despite their heroic efforts are now eliminated from Euro 2012. Now the eagerly anticipated matchup with Greece looms on the horizon. As the ongoing Greece/Germany debt crisis continues, this match will be a contest between those affected by the German austerity plan and the enforcers of that plan. Will the downtrodden Greeks made a shocking repeat of their 2004 campaign? Will Ze Germany reign supreme? We will have to wait and find out Friday.